Winter in Sonoma County can bring on days of cold, gray doldrums. Even when the garden seems to have the winter blahs there is a wonderful plant that will puncture the gloom. This shining star is Daphne. In myth, Daphne was the daughter of a river god who was so pursued by Apollo that her father changed her into a laurel tree to escape him (just to make things confusing, Daphne is the Greek name for the laurel, even though botanically Daphne and laurels are not related!) A delicious, sweet odor is the hallmark of this lovely shrub, which is native to Europe, North Africa and Asia. An evergreen or semi evergreen shrub with pinkish-white to pink flowers, divine-smelling Daphne can be grown in varied locales. However, all Daphnes require well amended and fast draining soil that retains enough water to prevent it from drying out completely, semi shade and a cover of mulch over their roots. During the dry season water infrequently, as less water increases flowering next spring. Daphnes do not require much pruning but may be tip pruned for shaping after flowers fade. Feed right after bloom with a complete fertilizer with a neutral pH. Daphnes are great companion plants in an herbaceous border or as a foundation planting around a house. As their flower smell is so intoxicating they are a great choice for a walkway or a semi shaded porch or deck. Their growth habit is slow to moderate and size amongst varieties varies from a low mat to shrubs that can reach 5 feet tall. Most Daphne do not transplant well, so site the plant where it will live permanently. All parts of Daphne plants are poisonous. Daphne is deer resistant. 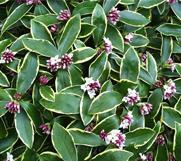 Evergreen shrub, with perhaps the most strongly scented flowers of all Daphne, as its species name suggests. Can sometimes display unpredictable behavior. It can flourish for years and then die without warning. Very neat plant to 4 feet high and wide with narrow thick glossy green leaves, and masses of fragrant flowers in late winter. “Aureo-Marginata” is widely grown and has variegated leaves. Evergreen, matting, spreading habit, less than one foot high and to three feet wide. Trailing narrow glossy green branches are covered with fragrant spring blossoms. A great rock garden plant, front of a border or pathway plant. After bloom, top dress with peat moss or similar material to encourage additional rooting of stems. Varieties include, “Eximia,” “Pgymaea Alba”and “Variegata”. Evergreen to semi-evergreen (can even be deciduous in some zones but not here in Sonoma). Attractive, well-formed shrub to three to four feet tall. Narrow leaves with bloom in spring and often a second bloom in late summer. ‘Carol Mackie’ is the variegated variety, with a gold edge to its green leaves.